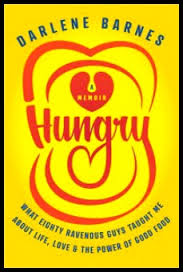 Hungry by Darlene Barnes was an unusual book for me. It's written by a feisty woman who was the cook at a Fraternity House for several years. Early in the book, I wasn't sure it was good enough to post about but all that changed. I ended up being really touched several times. And there are also a few good recipes in the book – no food pics though. As a non-American I knew next to nothing about the fraternity/sorority system so that was interesting to me in itself. I'm glad I read this even though I can't honestly say it was the best book of the year so far!